Grilled Corn charred to perfection and flavored with a creamy, smoky, and spicy chipotle sauce. 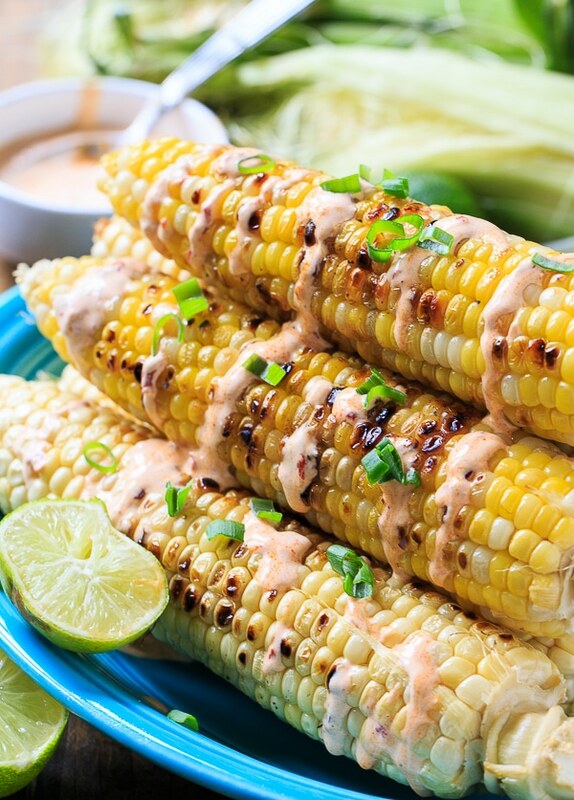 Grilled Corn with Chipotle Cream is one of the most delicious ways to eat summer corn. 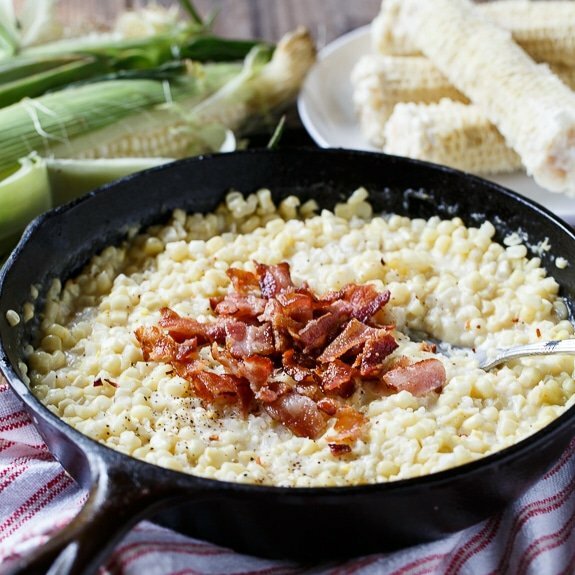 The contrast between the sweet corn and spicy chipotle cream is just perfect. 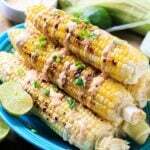 Grilled Corn with Chipotle Cream goes wonderfully with chimichangas, fajitas, or tacos. Or serve it at your next summer cookout. If serving as part of a Mexican meal, you could sprinkle some queso fresco or cotija cheese on the corn for more deliciousness. Then it would be perfect for Cinco de Mayo. The chipolte cream is a cinch to make. It’s just a mixture of mayonnaise, sour cream, lime juice, a little milk, chipotle peppers plus some adobo sauce from the Chipotle Peppers . You can change the ratio of mayonnaise to sour cream or use all mayo or all sour cream. Any way you do it, it’s going to turn out delicious. 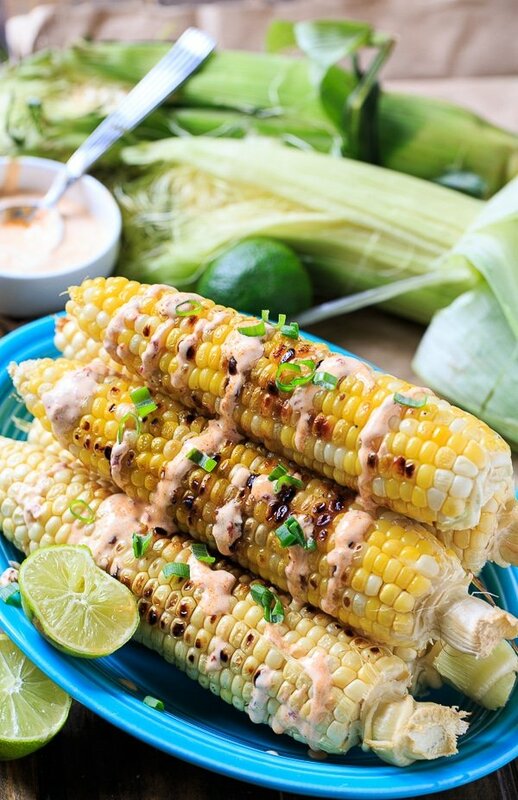 Grilled Corn with Chipotle Cream is charred to perfection and drizzled with a creamy, smoky, and spicy chipotle cream sauce. Grill corn on grill with lid covered for 10-15 minutes, turning to char all sides. In a small bowl, stir together mayonnaise, sour cream, milk, lime juice, chipotle peppers, adobo sauce, and salt. Drizzle sauce over corn and sprinkle with cilantro. This entry was posted in Side Dishes and tagged chipotle, corn, grilled. Bookmark the permalink. If this doesn’t look like the BEST way to eat sweet corn this summer I don’t even know what is!! I am in love with that chipotle cream!! The corn looks absolutely amazing, they must have tasted as good. We can’t get enough of grilled corn during the summer, it’s our favorite! This looks perfect, Christin! Love the chipotle cream! I have yet to jump on the grilled corn bandwagon – this looks so amazing and that chipotle cream Christin! Wow! This is beyond fabulous! 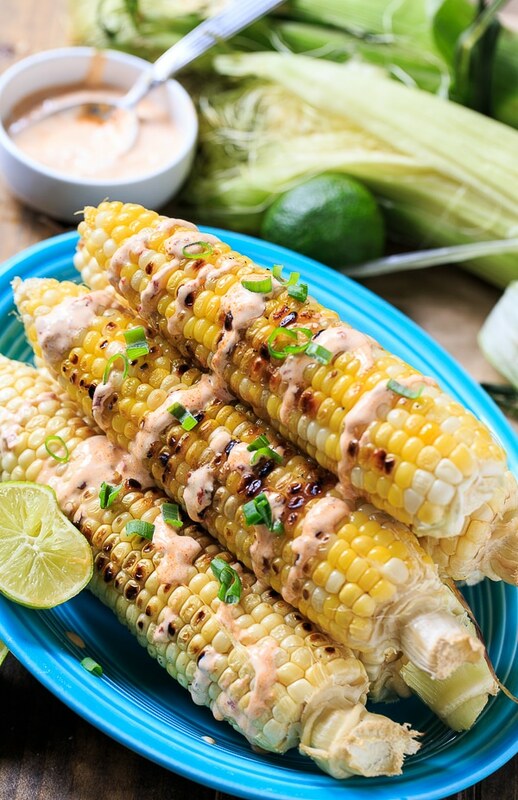 It’s hard to beat plain grilled corn, but that chipotle cream definitely does the task 🙂 Pinning! Grilled corn is just about my favorite veggie, so I’m loving the addition of chipotle cream! This sounds so perfect, Christin!